Ahead of tonight’s Norsk Melodi Grand Prix, last year’s entrant’s Kjetil Mørland and Debrah Scarlett have both released brand new music. Both acts have spent the last year playing intimate shows around the globe, while paying regular visits to the recording studio. This week, both performers have announced the release of new singles. Mørland has been in the music industry for several years now, and prior to the A Monster Like Me duet, was in a band called Absent Elk. They toured the U.K with The Script and Girls Aloud. Now as a solo act, Mørland announced that on February 22, his new track, Skin is available. The exquisite video was filmed in -17 degree temperatures just outside Oslo. Meanwhile, Mørland’s partner in crime, Miss Scarlett, has not been resting on her laurels either. After a quick trip to Los Angeles to perform some intimate shows, Debrah also announces the release of her debut single. The track is called To Figure, featuring Debrah’s deep jazzy voice. It is available on all music streaming sites. 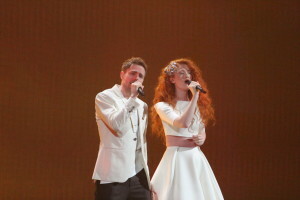 Tonight both acts promise a surprise at the Melodi Grand Prix final. You can watch from 20:55 CET.